Feel free to take a look at our real life case examples below to get a feel of the quality of our work at North Sydney Dentistry and our second practice Hornsby Dental, including some amazing Cosmetic Dentistry and Restorative Dentistry work. Our highly skilled dentists work at both practices for your convenience. Patient has slight uneven smile with some discoloration and unmatched old restorations. 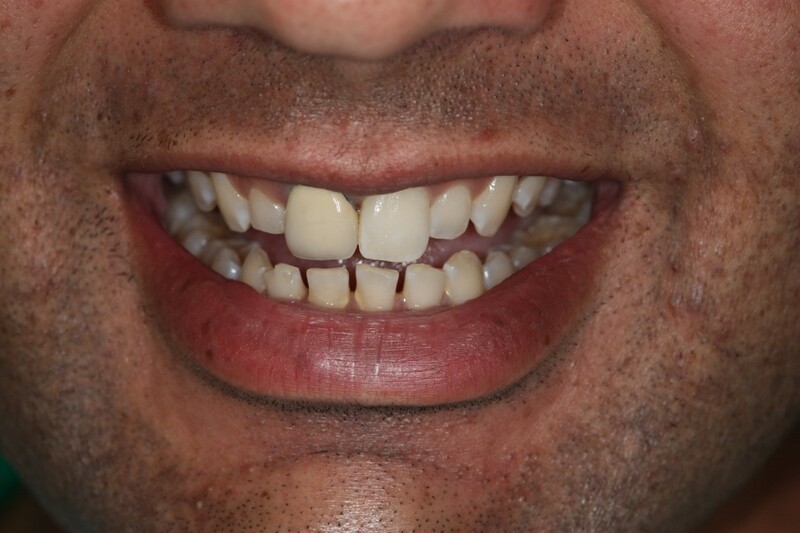 Composite resin veneers were placed to restore and improve the symmetry as well as function, without disrupting the patient’s existing bite. 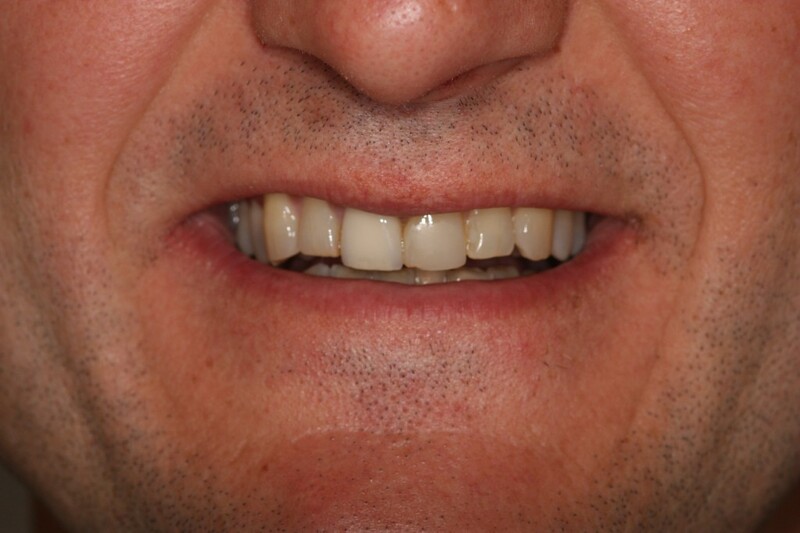 Patient has minor gaps in his front teeth and mid-line shifting. The patient was concerned about excessive preparation required to place traditional ceramic veneers, and opted for more conservative option. 4 direct composite resin veneers were placed with almost no reduction to the existing tooth structures. Complete replacement of old veneers with aesthetic new veneers more in proportion. Patient has multiple gaps between her teeth due to absence of adult teeth, and some discoloration due to natural wear and tear. Direct composite resin veneers were placed to close the gaps and improve the shade colours of the teeth. Patient has already a beautiful smile, but very minor problems bother her. The 3 front teeth are slightly mis-aligned resulting in gap and cross-over teeth. Composite resin veneers were placed with minimal reduction to her teeth. The gum height remains unaltered, although minor laser gum surgery can be elected to correct that as well. Patient is concerned about shortness of “gappy” looking teeth, despite the fact they were already quite straight and aesthetic. Mock-up of composite resin veneers was performed to show the patient what can be achieved, and patient was happy to consent to complete the treatment. While different designs of the edges and length of teeth were available, patient has opted for a straighter and squarer shape as her finish. After careful assessment and communication with the patient, the dentist was able to improve her smile and symmetry with a ceramic bridge. The patient’s expectations have been met and are always our priority in North Sydney Dental Care. 2 implant-supported dental crowns are placed to restore the smile. The patient is enjoying improved speech and function, without worrying about a wobbly denture again. Another happy North Sydney Dentist | North Sydney Dental Care patient. Patient has recently had her braces removed by another dentist. The young lady was happy with the decent alignment achieved from braces, however due to difficulty to clean, and possibly inadequate oral hygiene, the front teeth were damaged permanently, with physical cavitation from acid erosion and dental decays. These teeth will not be easily whitened by ordinary whitening procedures and dental veneers were necessary to improve their shade and shape. Patient had a severely decayed and broken down tooth. Result of the direct restoration, with both the function and aesthetics of the tooth back to normal. Old silver/amalgam filling that appears to have no apparent problem, however our close examination reveals fracture-lines running across the tooth. Deep recurrent decay accompanied by clearly visible fracture line. Amalgam restorations that have a high mercury content may behave like mercury in a thermometer – expands when termperature rises (hot food and drinks), and shrinks when cold. This can result in cracks of the tooth that is housing the amalgam. .Careful restoration of the teeth with crowns. The teeth have added strength and aesthetics. At North Sydney Dental Care we carefully select our dental lab to ensure high quality work. Badly broken down tooth due to tooth grinding beyond normal function. Even the amalgam restoration is broken from the excessive biting force. A simple direct restoration placed on the tooth restores the tooth back into function. In a compromised situation such as this, the restoration may not last as long as we would normally expect, and a crown is highly recommended. Heavily worn down molars with dentine exposure (the yellower porition of the teeth in the middle of the biting surface). These teeth have been subjected to night-time teeth grinding for many years, and have started to develop sensitivity with the dentine exposure. Dentine is the middle layer of the tooth right next to the pulp (nerve and blood circulation tissue in the core of a tooth), and its exposure often leads to sensitivity of teeth. Because of the collapsed bite, the patient required to have all of her dentition built up to restore function, as otherwise it would be impossible to seal the dentine. The molar in the picture is restored with composite resin as an interim restoration. Eventually all the teeth are restored with a newly established vertical dimension/bite. Once restoration is complete, the rehabilitation phase of treatment may include the use of crowns or ceramic onlays to prolong the lifespan of the teeth. Should you have any questions, feel free to contact one of our friendly staff at North Sydney Dental Care on (02) 8090 1108, e-mail on info@northsydneydentistry.com.au, online form below, or visit us at Level 3, Suite 302, 71 Walker Street, North Sydney, NSW 2060.